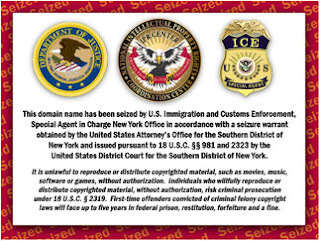 U.S. government agencies including the "US Immigration and Customs Enforcement’s (ICE)" and the "Homeland Security Investigations (HSI)", yesterday executed four residential search warrants and seized domain names as well as assets from bank, PayPal, investment and advertising accounts, under the "guise" of a crackdown on Internet piracy. Domains seized in the raids were TVShack.net, Movies-Links.TV, FilesPump.com, Now-Movies.com, PlanetMoviez.com, ThePirateCity.org and ZML.com. NinjaVideo.net and NinjaThis.net, two popular streaming services were also seized as part of the assault. I have to admit that I haven't even heard of any of these sites except one, the one I did know about, I never new was even breaking any laws. I can understand them going after sites that were hosting copyrighted files on their servers, but from what I understood about filespump, was that it was just a custom search engine that returned links to files hosted on other sites based on users search terms? If that's the case and they didn't host any files, then how are they any different to Google, Yahoo! or Bing? Doing a search on Google for keyword site:rapidshare.com, will return links to files stored on rapidshare that have "keyword" in them. There is nothing wrong with that, and to assume all files stored on sites like rapidshare are illegal, or copyrighted would be wrong. But depending on what keywords are used in the search, some of the results may be links to illegal or copyrighted material. So how is that any different to what filespump was doing. In fact I own a site called uvrx, which is basically just that, a custom search engine. I designed it to search for files on sites like rapidshare, megaupload etc. I have no files hosted on the site, and the site is not designed to find "illegal" files, but if someone used certain keywords in their search, then links to copyrighted material may be returned in the results. Both the domain name and website are hosted in the US. Could they seize uvrx too? This whole "Homeland Disney on ICE" situation has got me a little worried... But I don't feel like I should have to worry about it. After all, lots of people use Google to search for copyrighted files... and Google don't need to worry... do they?